I am passionate about promoting sun protection as my father passed away after a long battle against skin cancer and I have also had my own scare just a few years ago. Raising three active children in Florida makes it even more imperative for me to find the right products to product their fragile skin from the damaging effects of too much sun. Since we are a holistic family, I have been searching for years for a sunscreen brand that is all-natural in order to avoid using harsh chemicals while attempting to protect our skin. It seemed impossible to find until I discovered Goddess Garden Organics! 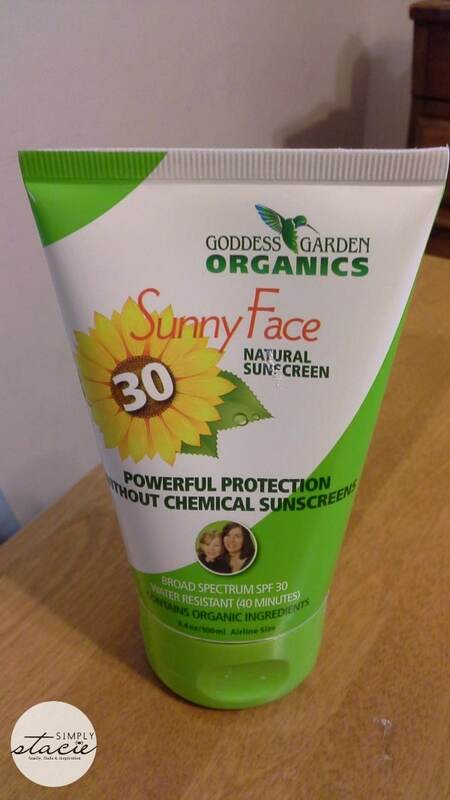 Goddess Garden Organics has a complete line of natural sunscreens for children, babies and adults that work by harnessing natural ingredients including sunflower, radish, zinc and titanium. By using natural ingredients, we were assured immediate effectiveness so we didn’t have to make the kids wait 20 minutes before heading outside to play. I also love that it absorbs into the skin for complete coverage instead of sitting on the skin like conventional, chemical-laden sunscreens. Finally, there are no harsh chemicals which have irritated my daughter’s asthma in the past and I have the peace of mind that their skin isn’t absorbing chemicals which could potentially cause problems for their developing bodies. 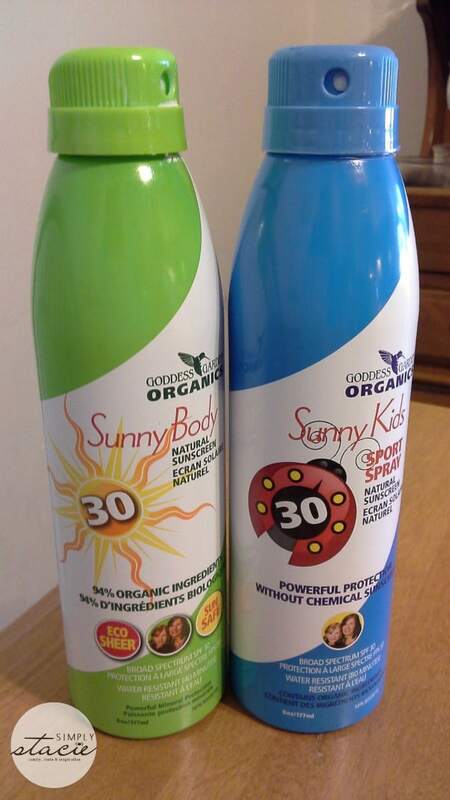 I was particularly thrilled to find a natural spray sunscreen and absolutely love the Sunny Kids Sport Spray SPF 30 (SRP $21.99). This is a continuous spray sunscreen which makes it easier than ever to apply all over the skin….even my youngest children could apply it themselves. Made with certified organic ingredients, I love that this product is water resistant for up to 80 minutes and provides both UVA and UVB protection which is extremely important. There is no scent and it is recommended by dermatologists so it does not irritate my daughter’s asthma or eczema which is a great bonus. We recently spent the entire day at the beach with full sun and I applied it to my children’s skin as needed with no sunburn at all….it worked great! My husband was initially very skeptical about trying the Goddess Garden Organics Sunny Body Natural Sunscreen Continuous Spray ($21.99) because he had a squamous cell cancer removed last year and feels like only the conventional brand products will work. I convinced him to try it at the beach and he was so impressed that he said he would never go back to other products. We both appreciated that it really works as stated with water resistance up to 40 minutes. We also liked that it is 100% bio-degradable and reef safe so we don’t have to worry about harming the environment either…..making this product a win-win! If you prefer lotion sunscreen in a bottle then I highly recommend using the Sunny Body Natural Sunscreen in SPR 30 (SRP $14.99). It is “Eco Sheer” which means there is no dreaded white coverage (all the products we tested have this added feature) and the lotion has a pleasant, fresh natural scent. It absorbs instantly in the skin to provide comprehensive protective coverage for up to 40 minutes while swimming or sweating. No more squirmy kids as I apply Sunny Face Natural Sunscreen SPF 30 (SRP $17.99) to their faces because this product goes on easily and absorbs very quickly without irritation. With other products, they complain that it burns their skin but they said this doesn’t do it. I actually use this product on my own facial skin every morning before applying additional products. I find this to be very economical to use because a tiny amount covers my entire face so a 3.4 oz. bottle is sure to last and it works well too. Overall, I am so pleased to have discovered the product line at Goddess Garden Organics and will stock up for spring and summer fun with my family. You are invited to visit the Goddess Garden website to browse the complete sunscreen product line to find the right sunscreen to protect your family! I would like to try their Natural Daily Lotion – Grapefruit Bergamot…i love anything grapefruit smell. I learned that Goddess Garden products are reef-safe, biodegradable and vegan. It’s more effective than conventional sunscreen. I learned it lasts for 80 minutes! That’s awesome! I like that it has less ingredients. I like the Baby Natural Sunscreen SPF 30, I feel it would be safe for my baby. I learned that the company deals with organic things. Never heard of em before. I love the bottle for the NATURAL SUNSCREEN SPRAY SPF30 – 8OZ. Goddess Garden sunscreens are essentially made up of organic lotion, minerals, and lavender essential oils. While minerals are very effective as a sun block, minerals cannot be certified organic since they are not grown. I like the Kids Natural Sunscreen Continuous Sport Spray, would be great for my boys. I would like to try the Natural Daily Lotion – Lavender Mint. I learned that Goddess Garden, a Boulder-based natural skincare company, was founded in 2004.
i love that garden goddess is made from organic ingredients. I would like to try the Lavender Mint lotion. These are so much better than what I have now.